With the Internet becoming a prevalent means of communication, there are many ways that we can stay in touch with family. With smartphones becoming the norm for many individuals, your parents don’t have to wait to chat with their children and grandchildren or to catch up with an old friend. Skype is a multi-dimensional communications download that is available for smartphones and computers, and even some televisions. The application uses the Internet to connect one person to the other, allowing you to conduct voice, video, conference calls and instant messaging. Any two people who are connected to the Internet and have the technological capability for chat or video can communicate with Skype calls at no charge. However, if you are calling to a cellular phone or landline, you can purchase monthly subscriptions or pay-as-you-go plans. Skype is also an excellent way to share documents or pictures with your loved ones, even if you are several states apart. Although many social media platforms are in a public forum, there are many ways that they can help you stay connected – especially with friends. Facebook and Twitter are by far the most popular options, though both are very different from one another. Facebook allows members to communicate through photo sharing, status updates and comments with their Facebook friends. Since it started out as a college-only application, many young people have already signed up, but older generations are becoming more adept at navigating the website, and many say it’s a great way to keep up with their family’s and friends’ activities, according to Socialnomics. Twitter is another free social media application that is essentially a microblog allowing for 140-character posts. You can subscribe to your friends’ or family members’ accounts and receive updates as they post them. If you already enjoy journaling, you might like online journals – also known as blogs. You can post as often or as little as you like and let your friends and family know what you are up to. On many sites, your family members can post responses, making this another excellent form of communication. Another option to stay connected with friends and family is setting up an email account if you haven’t already. Both of these tools can be access with a standard computer, laptop or tablet. 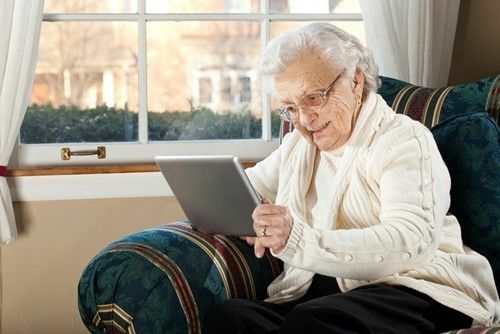 With so many 21st century communications advancements, logging in is an excellent way to stay in touch with family and friends, especially for seniors. When you visit your nearest Aegis Living community ask our Life Enrichment Director how they help residents stay in touch with family.